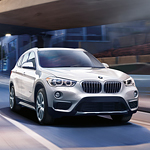 The BMW X1 is a vehicle that consumers clamor for, and it may be available for purchase at BMW of Visalia. One of its top features is the ability to take on any type of road without making you feel nauseous or sore. This is because it has dynamic stability and traction control capabilities built into it. This means that the weight is distributed throughout the vehicle, which provides better balance on smooth and rough roads alike. The vehicle's all-wheel drive system makes it possible to maintain grip and traction whether the road is dry or has snow or ice on it. Therefore, you can feel good that you and your family will get to work, school or anywhere else safely. The system responds to changing road conditions by redistributing power as needed. Doing so reduces the odds of slipping or sliding while the car is moving.